The gallbladder is an overlooked organ. Shaped like a pear it holds bile and is the located in the right side of your stomach. The liver produces bile and stores it in the gallbladder for its release. You don’t worry about it until something goes wrong with your body – like an excruciating pain after a big meal because your gallbladder has stones and it hurts (a lot!) when it tries to flatten itself to secrete the bile juice needed for digesting the food you had. Bile helps emulsify (dissolve/break fats into tiny bits) fats, which your body can absorb. Fats from good sources – fish, almonds, ghee are good for your body but without bile, your body can’t absorb them until they are broken down in tiny bits (emulsified). After bile breaks down the fat, the pancreas sends lipase to break down fats some more which makes it available to the body. When your bile is not working right you will have a poor digestion. You are likely to get acid-reflux, gas, nausea, vomiting and abdominal pain. You may develop gallstones (a crystallized version of bile). Most gallstones are made of cholesterol. Normally, your bile can emulsify the cholesterol of fatty foods, but if your liver secretes more cholesterol than your bile can dissolve, then the excess will get deposited in the form of crystals – gallbladder stones. Cholesterol gallstones are yellow in color. The other type of gallstones is formed of bilirubin. Bilirubin is a chemical that is produced when your body breaks down red blood cells. Certain conditions cause your liver to make too much bilirubin, including liver cirrhosis, biliary tract infections, and certain blood disorders. The excess bilirubin forms as pigment gallstones which is dark brown or black in color. Am I at risk of getting gallstones? Women are more prone to developing gallstones than men. Excess estrogen tends to increase cholesterol levels in bile which thickens the bile liquid causing cholesterol deposits in the gallbladder. Factors which increase estrogen level are pregnancy, use of oral contraceptive pills or taking hormone replacement therapies. In fact, gallstones are often mentioned as a side effect of estrogen therapies. Hypothyroidism – a condition which affects women can also contribute to gallstones. Low thyroid activity leads to a reduction in bile flow and increased the concentration of cholesterol in the bile fluid and less bile secretion. Gallstones are found more often in larger people. Insulin resistance and weight gain go hand-in-hand. When the cells of the body become resistant to insulin the pancreas is forced to secrete more of it. The body perceives an abundance of insulin as a cue to store fat. That explains the connection between obesity and insulin resistance. Yet, it doesn’t answer why obese individuals are at increased risk of getting gallstones. Recently, researchers have found the answer. 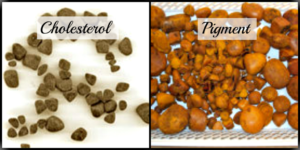 FOX01 protein is the exact cause of increased gallstones in obese individuals. As you know insulin regulates the protein. The absence of enough insulin to regulate protein properly activates FOX01. The activation of FOX01 causes the liver to produce glucose and increases cholesterol secretion into the liver’s bile which is then filtered into the gallbladder, thereby leading to gallstones and eventually gallbladder symptoms. That explains why diabetics are at risk of getting gallstones. Your body perceives stress as a sign of danger and diverts energy from non-necessary functions like digestion and stop the secretion of bile. Second, many of us become poor eaters in stress. In the absence of proper food and fat triggers, the secretion of bile would stop. Now you know, why abdominal bloating increases during the day (non-secretion of bile juices due to stress) and it improves during the night when you sleep and de-stress. The slow movement of intestines in constipation can form cholesterol gallstones. Slow transit allows the colon to re-absorb toxic substances like toxic bile, deoxycholic acid (DCA). When DCA reaches the liver, it makes it secrete more cholesterol into bile and when it reaches the gallbladder it hastens the crystallization of cholesterol. More often than not, your doctor will advise you a surgery to remove the gallbladder. It’s okay. You can live without one. Many people do because gallbladder stores bile doesn’t produce it. It’s the liver that produces bile. Still, before you go for gallbladder surgery (cholecystectomy), you may experiment with popular methods to cleanse gallstones naturally, but only if your symptoms are under control. Apple cider vinegar – Proponents claim that drinking a warm glass of water mixed with 15 ml of apple cider vinegar helps break gallstones naturally. Dandelion tea – According to the National Center for Complementary and Integrative Health, the bitter roots of dandelion stimulate bile production in the gallbladder. Historically, dandelion tea is known for treating gallbladder, liver, and bile duct problems. Milk thistle – This popular herb is very effective in improving liver health. Psyllium husk – Psyllium husk at bedtime keeps constipation at bay and research has shown that it benefits pancreas, heart and other areas of the body. Castor oil packs – Enthusiasts soak a piece of thick flannel in warm castor oil and apply it on the part of the abdomen where it hurts. Some choose to cover it with a hot water bag, others leave the pack on the abdomen for an hour. Users have claimed relief but before you start any of these, check with your doctor. To overcome gender bias of gallstones, you must try to reduce estrogen dominance. You can read SoulGuru’s article on estrogen dominance. Like most ailments prevention of gallstones starts with maintaining a healthy body weight, doing workouts to stay insulin sensitive and eating a diet which has a sensible mix of fat and fiber. Remember, your body releases bile to digest fat and going overboard on a low-fat diet or drastic weight loss can cause gallstones. Beware!